There are any number of things that can make a place memorable for us. Maybe someone we know and love is there. We might have had a great time there. Or maybe it is a place that so perfectly matches our souls that we instantly feel at home there (for me, that would include places like Luckenbach and the Terlingua porch). None of these things were so in the case of Corsicana, yet it will forever be carved into my memory as one of those special places. I was just moving to Texas and driving a 24-foot U-haul van trailering my car behind. I was on a mission. On an earlier trip for a campus interview with the University of Houston, (my first trip to Texas) my soon-to-be colleagues told me that barbeque was a religion in Texas. Back home in Indiana, barbeque meant the three H’s: hot dogs, hamburgers and a hibachi. They assured me Texas barbeque was something very different. Since I flew in for that interview and had a full schedule the entire time I was there, I didn’t have a chance to find out for myself. So on this long overland journey, pulling all my stuff behind me, I decided that when I finally reached Texas, I would find a barbeque restaurant and have lunch. I was told to avoid driving down 59 with such a huge load and to stay on the Interstate all the way to Dallas, and get on I-45 there. I trusted the advice and made Dallas just about lunchtime. I hate cities and the last thing I wanted to do was try to drive in town with my enormous “rig,” so I waited to find a lunch spot till I got well away from the urban mess. About 50 miles south of all that, I began looking for a barbeque restaurant. The first sign of one was just that—a road sign in Corsicana for a place called Clyde’s. I followed the directions on the sign and came to a stop at a tiny, run down shack that was probably a house back in the 1950s. Surely this couldn’t be what Texans call a restaurant! I didn’t know much about barbeque back then. Because my van and the trailer together were more than 40 feet long, and the four parking spots in front of the shack reached barely 10 feet, I pulled around to the side of the building and parked in the weeds and gravel. It was then that I saw an even smaller, dilapidated shed about eight by ten in size. Through the open, well-rotted barn door I could see that this was where the cooking was taking place. 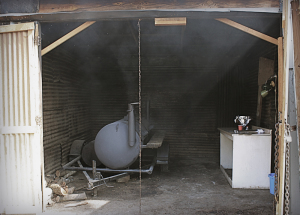 By then I was just about sure this was a serious mistake, but the smell of the mesquite smoke (something I had never experienced) made me just crazy enough to take a chance. With a smoke-induced high, I was feeling a bit better—until I opened the door and walked in. The place was even smaller than it looked from the outside. It could maybe seat 12 in a pinch. And it was clearly a dive. None of the tables matched and the chairs ranged from wood, to chrome to the steel folding variety. I sat at an old, four-seat Formica table much like we had at home when I was a kid, and I waited. After about five minutes, a girl came up to me and told me I had to order at the “window,” which was nothing more than a card table set up in the doorway that separated the front seating area from what looked like an even smaller back room. I ordered, and about three minutes later, my love affair with barbeque began. But that’s not why Corsicana stands out as a very special place to me. It was the other thing. It was fitting that at this time I would be starting a new life in a new place because I had recently become a new person. When I was in my twenties, I was an immature kid with a major attitude problem. My thirties and early forties were a learning time. It took me 12 years to move to where I was that day in Corsicana. Mostly, I had to go from seeing myself as a helpless victim kept down by the powers-that-be, to that day where I understood that if I just kept fighting, I could beat “them” and be successful in spite of anything they might throw at me. After all, I had successfully completed grad school. I knew they don’t give you a Ph.D. from a top-rated program because you are smart, but rather, because you are tenacious. Few are thrown out of the better programs. Most people who don’t succeed just give up. That day, feeling like I had it all figured out and I had won, I moved on to my new life. Blame it on Texas. Maybe it is the air, or the barbeque, but as I worked my way through that plate of ribs and brisket, I started getting the feeling that I had gotten it all wrong. And that left me with an uneasy feeling. When you spend two days driving alone, you have lots of time to think. I had spent almost all of that time going over the 12 years of learning and the final lesson I had taken from it all—if you hang in there, you can beat them. And yet, in all that driving, I had thought about several people who took time out of their lives to try to help me find my way. Sometimes I listened; mostly I didn’t. I remembered every success along the way (because they were so rare) and realized that, almost without exception, they came after the intervention of someone who cared—an intervention I chose to listen to. One thing led to another, as our stream-of-consciousness thoughts usually do, and as I was eating the last rib it hit me; I had gotten the lesson wrong. I didn’t succeed by beating “them.” After years of struggling, I just stopped beating myself. The unfinished rib dropped to the plate with a bang. Corsicana is forever stamped on my heart not because of a special someone, not because I had a great time there, and certainly not because it suits my soul. Corsicana will always be special to me because of what happened to me there. I made a life-changing discovery. I had spent 12 years finding truths and had a much better life for it. But this was not what was important about that day. And it wasn’t that I finally realized I only needed to stop beating myself. Those were just steps along the way. The crucial event there in Clyde’s Barbeque was learning a far more important thing—something life changing. Losing a single illusion makes us far wiser than finding a multitude of truths. I had lost the illusion of victimhood—of a “them” that I was fighting against. And life is so much better today as a result. Besides, Corsicana began my obsession with barbeque. A man has to be thankful for that!